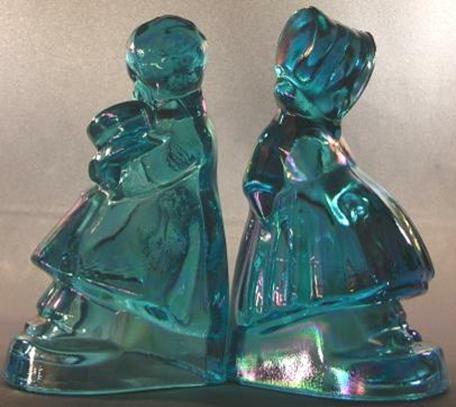 Victorian Girl and Boy Bookends. Wheaton Glass – Circa 1970s. 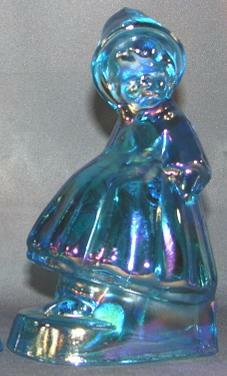 Blue iridized carnival glass. Measures 5” high x 3” wide x 3” deep. Weighs 1-1/2 lbs. the pair. These were originally from a K.R.Haley mold, issued by American Glass Company, and later reissued by Wheaton Glass in multiple colors. Great condition.